The Polar FT7 offers all the features of the FT4 plus EnergyPointer. EnergyPointer visually indicates when you are in your fat-burning range or aerobic fitness range. 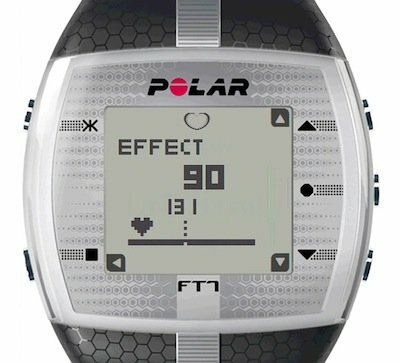 A weekly training summary provides feedback for your workouts and keeps up to 99 files iThe Polar FT7 is a rugged watch and data-tracking heart rate monitor, combined in one attractive package. An innovative EnergyPointer feature graphically displays real-time information during your workout, letting you know if you’re burning fat or improving aerobic fitness. The FT7 comes complete with comfortable fabric transmitter and coded heart rate transmission, to avoid electronic cross-talk. An easy-to-read EnergyPointer feature tells you if you’re burning fat (left of center line) or building fitness (right of center line). Energy Pointer: If you want to improve your fitness or burn fat, EnergyPointer is an easy-to-use feature that visually shows the main effect of your training, so you can focus on what you want to achieve. OwnCal: OwnCal is one of the most accurate calorie counters on the market. It calculates the number of calories expended during a training session based on your weight, height, age, gender, individual maximum heart rate (HRmax), and how hard you’re training. Training Load: The web-based Training Load helps you strike a balance between rest and training, showing your daily cumulative training load, and advising when rest days are needed and when it’s best to train harder in order to maintai performance improvement.